Beautiful home in Adonea. The main floor boasts an office with french doors, a formal dining area, wood floors, a large family room with vaulted ceilings and fireplace, eating space off the kitchen with easy access to the backyard, a stunning kitchen with all appliances included, and island and 2 pantries for plenty of storage. The upper level offers a wonderful master bedroom with private master bathroom, a laundry room, 2 secondary bedrooms connected by a full jack and jill bath and an additional secondary bedroom with a private bathroom. The 3 car garage offers ample parking an storage and the corner lot provides a large private yard that is rare with newer homes. The full basement is ready for your finish. Just steps from the clubhouse, community pool and parks. 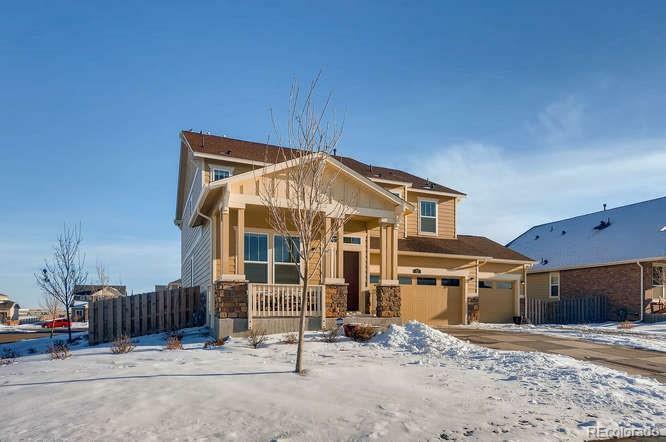 Easy access to highways, minutes to DIA and close to shopping and amenities. This home has it all!